Chris Tribuna of Balloon Design Studio! Every month our Board picks a Chamber Member in a random drawing to be featured on our website and social media platforms as a "Member Spotlight"
Interested in being featured? Please complete THIS FORM for a chance to be featured on our website and social media platforms for one full month! To say that balloons are an “obsession” for Chris Tribuna, may be an understatement. “My parents couldn’t leave me at my friend’s birthday parties because I would rip down all the balloons and try to take them with me when I left,” said Chris. 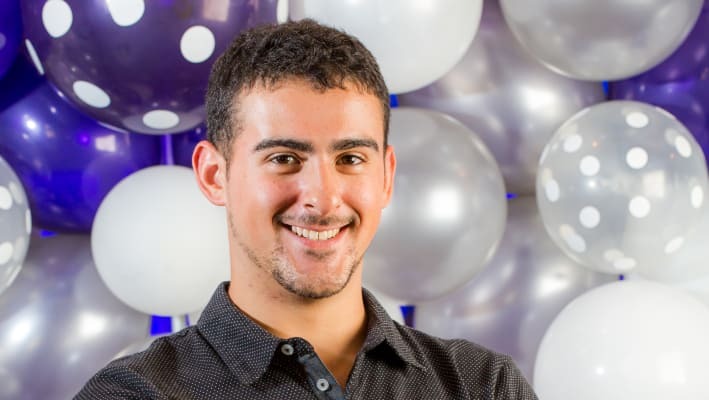 He decided shortly thereafter to turn his passion into a profession and at the age of just thirteen, Chris founded his first company, Twist With Me 2; a balloon décor business that catered to hundreds of parties and events. Having become a Certified Balloon Artist in 2014 and with business rapidly picking up steam, it was time to re-brand. In 2017, Twist With Me 2 became Balloon Design Studio as we know it today. Chris and his team travel all over the country to decorate for private and corporate events including events for various celebrities, in the New York Metropolitan area. Chris became certified as an LGBT-owned enterprise with the National Gay and Lesbian Chamber of Commerce and at the end of 2018 was named one of Business Equality Magazine’s “40 Under 40”. Today, the age of 22, it’s safe to say that Chris’ “balloon” hasn’t burst! He is a shining example of the entrepreneurial spirit and he is excited to see were his business and membership with the New Jersey LGBT Chamber of Commerce will take him next! What services do you provide? How long have you been in business? Balloon Design Studio provides amazing balloon decor for corporate events and private parties. We create balloon centerpieces, arches, columns, sculptures, bouquets, photo ops, and more! Who do you want to work with / Who is your target audience? Our target audience is very broad as there is always a reason for balloons whether it is for a corporate event or small private party. Ideally, we want to work with more corporate companies, universities, schools, professional sports teams, and private clients. What separates your business from the competition? What separates us from the competition is that we like to push boundaries and create experiential pieces of art to “wow” clients and their guests. How can other members refer you to your ideal clients/customers? How long have you been a member of the NJ LGBT Chamber of Commerce? I have been a member since 2018. Are you a certified LGBT Business Enterprise or are you planning on becoming certified? Balloon Design Studio is proud to be a certified LGBT Business Enterprise as of September 14, 2018. What do you wish to accomplish (or have you already accomplished) with your membership with the NJ LGBT Chamber of Commerce? What I wish to accomplish with my NJ LGBT Chamber of Commerce membership is to make new friends, connect with other entrepreneurs, make business relations, and to help grow and support the LGBT community. We like to offer our members specials or deals that come from other members! Do you have any products or services you’d like to exclusively offer or discount for NJ LGBT Chamber Members? Mention this spotlight and receive 10% off on your first order with us! The discount is applied before tax, delivery, and removal (if needed).